Scaffolding Units (APSU) We are pioneer ON HIRE and supplier of standard all purpose Scaffolding Units, which consisted of two verticals and one horizontal/cross bar, both made out of 40 pipes, and sockets out of 50 pipes, conforming to IS 1161 grade Y st 22, Lugs, welded at 500 mm centers. Industrial Scaffolding Units provide positive support to horizontals, which has unique three ways coupling, welding at both ends to fix ledger pipe, connecting the units. These Mobile Scaffolding Units and Steel Scaffolding Units are highly reliable, durable and supplied at very reasonable prices to offer optimum gratification to customers. 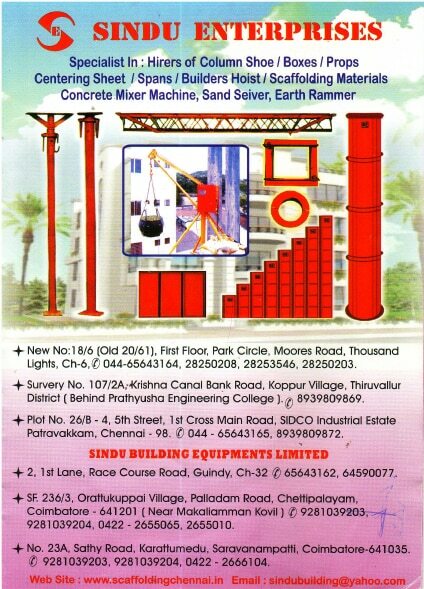 Earth Rammer Rental In Chennai Are you looking for Earth Rammer Rental Service In Chennai.We are the Best Earth Rammer Rental In Chennai.Kindly contact us for more information about price and services. CONCRETE MIXER MACHINE: Concrete Mixer Machine rental in chennai.Are you looking for Concrete Mixer Machine in chennai.Weare the best Concrete Mixer Machine renatal in chennai. A concrete mixer is a device that homogeneously combines cement, aggregate such as sand or An alternative to a machine is mixing concrete by hand. Kindly contact us for more information about price and services.